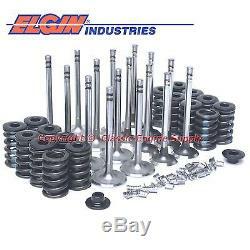 This listing is for a brand new cylinder head parts kit that comes with stock style valves with chrome plated stems, Z28 style performance valve springs, hardened spring retainers and hardened valve locks that are made by Elgin Industries. 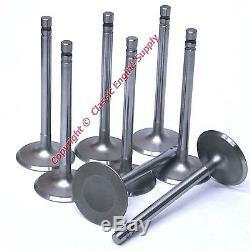 (8) 1.94 Steel intake valves with chrome plated stems. 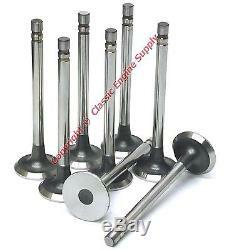 (8) 1.5" Steel 1.5" exhaust valves with chrome plated stems. (16) Stock diameter Z28 style valve springs. (16) Hardened 7° valve spring retainers. (32) Hardened 7° valve locks. They work great for stock, towing and most mild performance cams and work best with cams up to 0.500 lift. Many sellers claim these springs can handle up to 0.550" maximum lift but I personally don't believe they have enough spring pressure to handle more than 0.500" lift. Spring Type: Single with damper. Intake Valve Part Number: I408B. Stem Diameter: 0.3414" (11/32"). Stem Type: 2 Groove - Chrome Plated. Exhaust Valve Part Number: E1923B. Stem Diameter: 0.3404/0.3414" (11/32"). Powered by SixBit's eCommerce Solution. 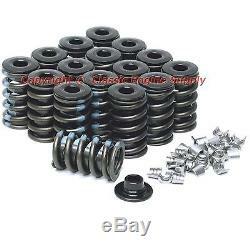 The item "New Z28 Springs, 1.94 Intake & 1.5 Exhaust Valve Set Chevy 400 350 327 283" is in sale since Tuesday, November 04, 2014. This item is in the category "eBay Motors\Parts & Accessories\Car & Truck Parts\Engines & Components\Valves & Parts".